Tokyo, November 25, 2014 - Subaru Tecnica International Inc. (STI)*1 today announced the release of the Subaru "Forester tS", which goes on sale on November 25 through Subaru dealerships in Japan. 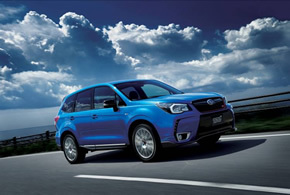 With a development concept focused on creating an on-road vehicle which has a rugged styling, responsive handling performance and quality feel, the Forester tS offers an enhanced version of the driving performance the Forester provides as an SUV, delivering the ultimate in driving enjoyment and pleasure of ownership. The Forester tS benefits from its own exclusive tuning the "S# (Sport Sharp) mode" for "SI-DRIVE". Driving performance has also been enhanced by the adoption of "brembo" ventilated disc brakes, BBS-designed 19-inch forged aluminum wheels and STI-designed front and rear under spoilers. The exclusively tuned suspension and use of STI's unique flexible parts mean that, under any conditions, the Forester tS delivers the "strong and nimble" driving feel on which STI prides itself. The new model comes with distinctive specifications: On the exterior these include the "STI" ornament and cherry red pinstripe on the front grille and rear bumper, while the interior features a speedometer with an STI logo and a carbon-toned instrument panel. Features such as these serve to reinforce the model's identity as an STI-tuned car, evoking the pleasure of ownership. The Forester tS is equipped with Subaru's unique driver assist technology, EyeSight*2, and is exclusively tuned to accommodate its lower ride height and brembo-designed brakes. It was also developed with careful attention to noise reduction, employing floor mats covered in sound insulating material, among other measures. *2: EyeSight(ver.2) as it is known on the Japanese market. Note: Body colors available are WR Blue Mica,*3 Crystal White Pearl,*4 Ice Silver Metallic, and Crystal Black Silica. *3: Must be preordered by February 8, 2015. *4: Costs 32,400 yen extra (including consumption tax).